Kenya loves babies! Everywhere we go, if she sees a baby, she says, "Baby I want to hold it." She remembers all the babies names at church and if they are crying she says, "Oh baby need passie." So I was wondering how she would do when Melody and Madison are born,...would she try to pull them apart, or ask us to? I just didn't know. Jason and I wanted to try to prepare her as much as possible so we bought two baby dolls, glued them together and started calling them Melody and Madison. She tried to pull them apart a few times so we told her, "Kenya, look there are two babies and they are stuck together we cant pull them apart, just like Melody and Madison." Then we told her, "Look Kenya, (and pointed to my belly) Melody and Madison, lets count them,... one,... two babies and they are going to stay together just like your babies." I don't think she fully understands but I do think she will be more prepared for the day she meets her sisters. She played with them for about an hour before she took a nap. She loved feeding them, giving them their passie, and rocking them to sleep. She doesn't try to pull them apart anymore and loves her new babies. Jason was working on getting a worship set ready for church and Kenya decided that she needed a sling for her baby. She used his guitar strap wrapped it around herself then said "mommy help" so I got it to stay on her. I thought these pictures were soooo cute I had to share! We went to the doctor yesterday and it was a much better experience than the first time. We had to wait for two hours to get in but I didn't care I was just happy to be there. We were so excited when they called us back. I asked the sonogram tech if she could spend some time getting really good shots of the babies because all the sonograms we had up until that point they had just been measuring the girls. She was more than happy to do that and Jason and I were so thankful! We got to see baby B swallowing and sucking her thumb and she got a really good shot of baby A's face. We haven't really said ok baby A is Melody and Baby B is Madison because we know they can turn and also when they are delivered I don't want to be stressing about them not mixing the babies up. Destinee has already informed us that when they come out Melody is the one on the left and Madison will be the one on the right, she is so cute! After she finished doing her part of the sonogram our Doctor came in, he was so SWEET this time. Not that he wasn't last time I think he just didn't want to give us false hope so we took it as him being harsh. He came in and did his part of the sonogram and said the babies look good . One of them weighs about one pound 9 ounces and the other one weighs about one pound 10 ounces. It's hard for them to know exactly since they are joined at the chest so they can't get a very good measurement of their chests. He said they are growing lung tissue which is really good because that was one of the fears to begin with is that their lungs wouldn't develop. He took a lot of time looking at their heart,... to make a long confusing story short he basically said if they make it to full term he is just not sure how long they will live after that. It may be a few minutes, a few hours, a few days, or months we wont know though until after they are born and we see if their heart will be able to support them both and for how long. That was much better to hear than they have a zero chance of survival. My amniotic fluid level is good, he said if I was going to develop too much amniotic fluid that it would have already happened by this point so he is not concerned with that. My blood pressure is also good. Our doctor spent a lot of time with us answering questions and just trying to offer some comfort. He wanted to make sure we were all on the same page as far as their birth goes so we talked about that for a while. He told us that he respected our wishes and would do everything that he could to take care of the babies and myself. He also let us know that modern medicine only goes so far. Were pretty sure what he was taking about was the fact that they just can't do open heart surgery on conjoined twins. He is referring us to a cardiologist and a neonatologist so we will be seeing all three doctors from now on and they will be meeting often to make sure that they are all on the same page. Oh and such good news, we go back to see our doctor in two weeks! I cant handle that this whole waiting a month thing, it almost drove me crazy but two weeks I can do. The only concern I had was every once in a while I can't get a full breath. It's not like I'm not breathing I just can get a good full breath sometimes. He said that was due to the fact that my uterus is already the size of a full term uterus and we have two big babies in there. I said I am ok with that as long as it is normal! Kenya fell and scraped her knee while playing outside. You would have thought she broke her leg the way she was crying. I know this should not be that big of a deal but she doesn't get hurt very often so it was really sad. I brought her inside cleaned it out put some band aids on it and you would think that was the end of it. But she was still very sad. "you cant be sad when your eating ice cream"
it has proven true time and time again. Hello all here are my belly shots for last week. I got my weeks mixed up I am 24 weeks in these pictures. Kenya was helping me measure. She also wanted to measure herself. Kenya sings "Melody Madison Clap Clap Clap"
Remember the Melody and Madison song I told you about? I'm not sure why the screen is black but the video works, just click play. Kenya loves having her picture taken most of the time. She will just smile and ham it up. She was saying "Momma, I don't want a picture." Praise God from whom all blessings flow we have made it to 23 weeks. We are so thankful for this trial that God has brought us to He is teaching us so much! More blogs to come on all the things that He is teaching us. I just wanted to send out a blog to let everyone know that we are doing good. I'm still on bed rest which is a choice that Jason and I made to give the babies the best chance possible. I have a few Braxton Hick's contractions every once in a while but nothing major. Melody and Madison move all the time I love it! I have been able to keep Kenya at home with me I just lay down and play with her or just let her run around and play. She is such an easy kid we are very blessed. Destinee is doing great she is in ninth grade this year I can't believe it, high school we have a kid in high school (my little sister lives with us) . She is such a blessing to be around she keeps me laughing all the time. Now on to my sweet husband words can not express how thankful I am for my husband. Since I have been on bed rest he has been doing everything and I mean everything. I couldn't do this without him! We go back to the doctor on the 19th I can't wait to see the babies again and hear how they are doing. I will post a blog as soon as we get home (well maybe). I will post one soon there after. I just wanted to say thank you to everyone that has been praying for us. The love and support we have had has been very overwhelming in a good way. God is being glorified and we are thankful to be a part of it. Kenya loves my belly she sings a song to the girls "Melody, Madison clap clap clap" it is so cute! Click here to watch it! Kenya loves showing off her muscles! Enjoy the video. The Pizza Place has the BEST pizza in the world! Well I haven't tried all the pizza in the world but I can say it's the best pizza around these parts. I'm pregnant and picky and I love it! Little Kenya eating pizza like a big girl. 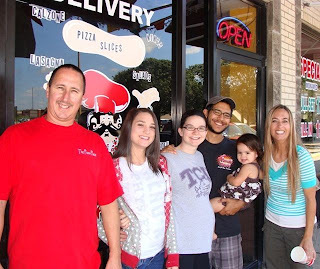 From left to right we have our very good friend and owner of the Pizza Place Felix, my sweet little sister Destinee, a very pregnant me, the love of my life Jason, little Kenya, and our dear friend Trish. 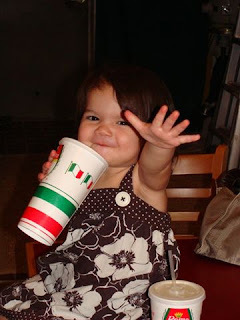 Kenya always has fun at the Pizza Place and you will too! Go check it out at the corner of Western Center and 35 in the 7-11 parking lot. Kenya had so much fun playing in the bumper pads for Melody and Madison's crib. She played for hours turning the bumper pads into different shapes that she could climb through. Two trips to the hospital in three days. I never get tired of hearing Melody and Madison's heart beat. This past week was a little crazy we went to the hospital twice both times because I thought I was in labor. My mucus plug came out on Saturday which is normally a sign that labor will follow shortly after. So we went to the hospital as far as they could tell everything was fine and we would just have to wait to see what me body did. We just needed to go home and relax. That was good news! Then I woke up on Tuesday morning to some pretty strong contractions and a lot of pressure. I waited for a few hours to see if it would get any better, but it got worse so Jason came home early from work and took me to the hospital. I was sure I was in labor but once again they said that everything was fine I just needed to take it easy. Of course that was after being there for about four hours. I didn't mind though we got to hear the babies heart beat the whole time. Our doctor informed us that all the pressure and contractions were from all the extra amniotic fluid that comes with carrying twins. I was so thankful that I wasn't in labor and everything was fine with the babies. So now I'm on bed rest. Please be praying that I don't waste this time that the Lord has given me to just be still. That I would use this time to study and learn more about the Lord and not become distracted with all the things of the world. Also be praying that my body wont produce too much amniotic fluid I'm not exactly sure why but I know it's not a good thing if you have too much. Thanks for keeping up with our family. We go back to the doctor on the September 19th so I hope to have more details about the babies at that time.